Seeking to understand the events and trends of the Global Economy by solely comparing such various models as Capitalism, Communism, or Socialism is akin to attempting to interpret a great literary work by comparing the letters of the alphabet. A true and full understanding of any and all given economic “systems” must take into deep consideration the instinctual, religious, political and cultural influences upon consumer choices, attitudes concerning work ethic standards, and moral codes dictating social behaviors. Until this critical assessment is achieved, humankind shall remain tangled up in the cross hairs of countless bloody wars, social violence, relentless poverty, and an academic agenda that is subservient to the military-industrial complex. This series of essays not only addresses the myriad of ills plaguing human societies across the globe, but attempts to pinpoint their interconnected causation through a cross-disciplinary examination. 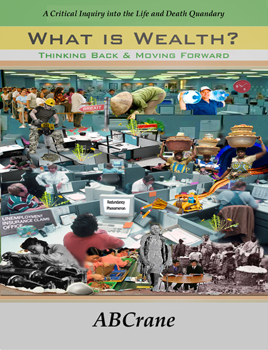 The critical inquiry into the age old question, “What is Wealth?,” is the starting point whereby individuals and communities can begin to innovate and implement economic models that benefit workers, consumers, and the natural environment.